Lima beans only appear in the green market in the fall and they don’t hang around for very long. I suspect that this is because they are a pain to disrobe from their tough pod and honestly I don’t think many people like them very much. I, on the other hand, really like them and try my darndest to pick out the pods that contain pale green, medium-sized beans. The large beans tend to be starchy and not very flavorful – at least to me. The tiny ones are so small that you would have to buy pounds and pounds to unearth enough for a meal. This is a long way to say that when I find them I buy whatever I can. Sometimes serve them like I do fava beans – let guests peel off the pod and eat the raw beans with some slivers of cheese – ricotta salata, parmesan, or any other hard cheese that you can peel off paper thin slices. When cooking, I often mix them up with other vegetables or beans and do a quick stir in some olive oil and butter or with some pancetta or bacon to add some smoky flavor. Always add a little onion and a nice bit of salt and pepper. You could do the same thing with frozen limas that you have let thaw and patted dry, but oddly I never do. I just prefer the fresh beans and the fact that they are so seasonal makes them even more alluring. 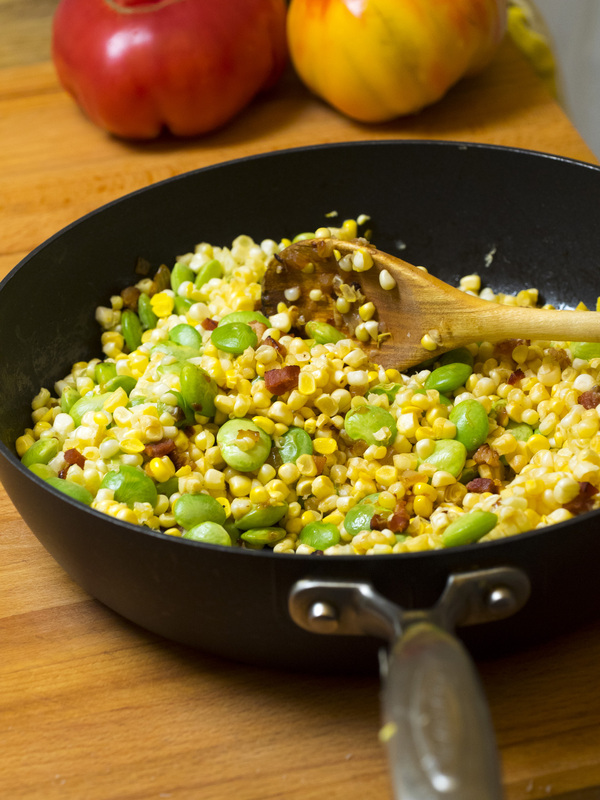 Succotash is a very early American recipe combining our native beans and corn, but I only seem to make it in the summer when I can get fresh lima beans and corn locally. I never think of making it in the winter with frozen vegetables, although I suppose it is probably still pretty good. Fresh limas are not so easy to come by even in the farmers market. I don’t know if this is because people don’t buy them or farmers don’t like to grow them. But I do know that whenever I see them, I snap them up. I got great ones the other day at the farmers market and although we haven’t had great luck with corn this summer, I bought some ears to make a Sunday supper of succotash topped with sliced grilled (on my stove top grill pan) chicken breast. What a tasty meal – with a side of sliced heirloom tomatoes and a bowl of pickled beets. Summer at its best! Place the bacon and onion in a nonstick pan over medium heat. Add the butter and cook, stirring frequently, for about 7 minutes or until the bacon has begun to color and the onions have softened. Add the lima beans and corn, stirring to blend. Add the cream, season with salt and pepper, cover, and cook, stirring occasionally, for about 10 minutes or just until the beans are tender.